1. Ancient wisdom says, “your friend is your enemy and your enemy is your friend”. In the gold & silver market, this ancient wisdom may be particularly valuable for investors today. 2. Gold plays the role of punisher in this crisis, and punishes the debt-a-holics. The crisis is enormous, and could go on for decades, but just because the crisis may have decades to run doesn’t mean that gold rises forcefully, all the time. 3. The economy can have enormous bouts of strength while slowly disintegrating, and you have all seen the shockingly bullish economic reports pouring out, in recent months. Analysts continue to under-estimate the economic numbers. 4. Something has got to give here; either the analysts are correct and economic numbers are about to nose-dive, or the economy is surfing a much bigger up wave than the analysts comprehend. 5. You can click here to view a larger version of the current gold chart below. Note the small head and shoulders top pattern in play, and the broken uptrend line. I personally couldn’t care less about the microscopic fall in price implied by this technical action. I’m only interested in buying price sales of $100 or more. 6. My interest lies with the divergence between gold and silver, and why that divergence may be occurring. Silver investors can click here for a larger version of the chart below. I’ve talked about the importance of silver investors holding your ground against “big sister gold”. Life as the little brother can be frustrating at times, but this could well be your time to shine, but not because silver is “poor man’s gold”. 7. Last night the price of silver ripped thru its right shoulder high, and the price action is beginning to resemble the action of the Dow, even more so than that of gold. Click here to view a larger version of the Dow “chomping at the 13,000 point bit”. Silver’s price action in the $36 area is very similar to the price action of the Dow in the 13,000 point area. 8. If we are on the cusp of an institutional capitulation, one that acknowledges that a much bigger recovery has started, then silver, platinum, and palladium could all out-perform gold. 9. If not, then silver is likely to resume its role as “gold’s sidecar”, and still fare pretty well. Platinum and palladium may not fare as well as silver if the crisis accelerates dramatically. 10. Gold appears to be silver’s best friend, but if a shocking economic revival is just around the corner, perhaps it is the supposed enemies of silver, the Dow and real estate, who will become silver’s friends, at least for a period of economic time. 11. How big of an economic surge am I talking about? 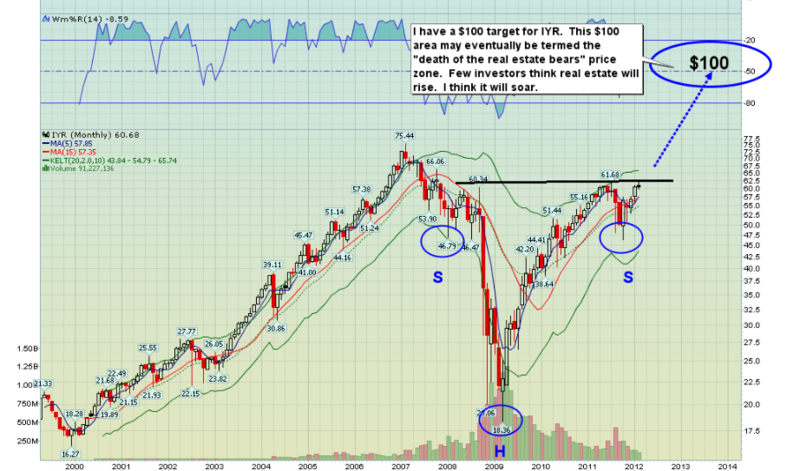 To view the shocking super-rally in real estate that I am predicting, click here for a larger chart. 12. That’s the IYR-nyse real estate ETF from ishares, and I’m predicting a near-immediate rise in price to my $100 price target, a scenario that will cause 99% of the gold community to do the ultimate “double take”. 13. There’s an enormous head & shoulders pattern on the monthly chart, and the daily chart also looks extremely positive. Click for a larger chart here. 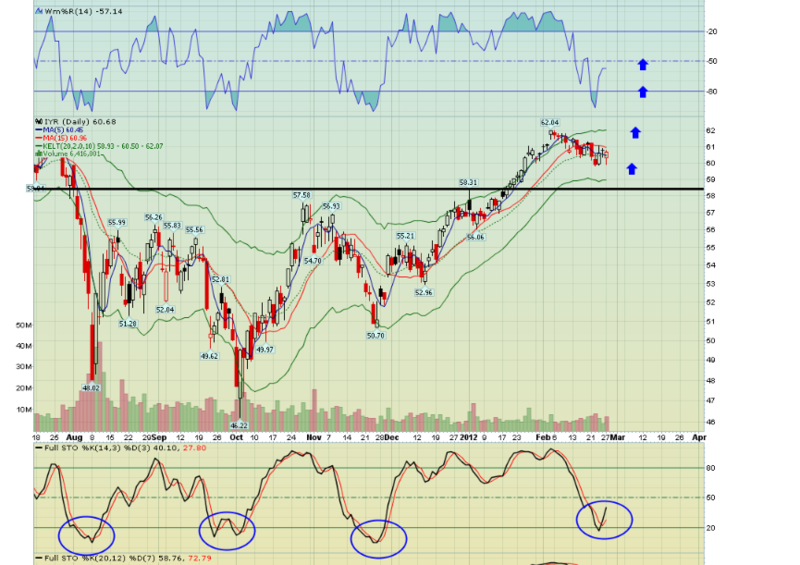 Note the position of the Stochastics oscillator, and the solid support in the $58 price range. 14. Both real estate and the Dow may add surprising fuel to the silver rally, but that doesn’t mean you should buy today. Bullish price patterns reveal where price might go on the upside, but they are not buy signals. 15. It’s critical to understand that surprise is the theme of this crisis. It’s equally critical to understand that the markets are a fight more than an investment. You don’t really have “fellow investors”. You have opponents that you need to ravage and destroy. You can face that fact, or be destroyed by those who live the markets in fight-mode. 16. You can’t buy silver after it has skyrocketed, because you will be buying it from strong hands, and doing so alongside weak hands. If you don’t feel morbid when you buy, don’t buy. 17. What’s better, to feel morbid when you buy, or morbid when you sell out at a loss? Buy in the morbid zone and sell in your personal party and analysis zone. Those who want to feel good both on the buy and on the sell are likely living a pipedream. 18. If we are entering a period of shocking economic growth, albeit growth printed out of an electronic photocopier machine, then perhaps silver and other industrial-precious hybrid metals will substantially outperform gold for a period of time. 19. If real estate joins the Dow in ravaging the dollar, then gold stocks could also join silver in outperforming gold. I’m fully aware that most of the gold community is highly invested in gold stocks, with many in the community owning no gold bullion at all. 20. While the policy of holding no gold bullion is a bad mistake, that doesn’t change the fact that it could be your time to shine, if you are all-in on gold stocks. Real estate and the Dow, the gold stock community’s “enemies”, may soon become your trusted friend, for at least a period of time. 21. You can click here for a larger chart to view the GDX chart. I’m an immediate buyer at the $55.50 and $53.50 price points. Note the action around the $58 price point. GDX is attempting to blast over the red trend line. If the Dow surges through 13,000 and the IYR rips up through $61.68, I think GDX could experience a “price flash” to $70. 22. The incredible 35% rally in gold junior stocks, via GDXJ, has been all but forgotten, and with good reason. Most gold junior investors are 50-70% underwater, and more so in some cases. Just because the Dow investors of 1929 were wiped out didn’t mean the Dow couldn’t rise from the ashes, and it is the same with junior gold stocks today. 23. Click here for a larger chart to view the asset class most likely to continue the out-performance that it began two months ago. GDXJ has entered an uptrend channel and is showing light volume on this decline. 24. 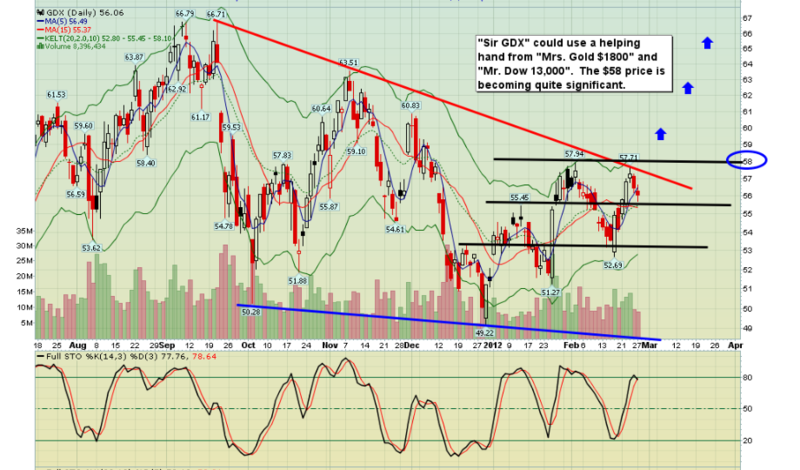 You should be an immediate buyer of GDXJ at $27.16, if you are lucky enough to see price go there. If you like gold junior stocks, stare hard into the copper, real estate, platinum, and palladium charts. Those asset classes look set to blast higher and may drastically outperform gold! Special Offer for 321Gold readers: Send an email to freereports@gracelandupdates.com and I’ll send you my free “Platinum & Palladium, Your Spaceship To Mars?” report! Only about two dozen of these securities exist… but double-digit yields are common. I first uncovered this asset class years ago, back when I started my High-Yield Investing advisory in 2004. In October of that year, I added one of these securities to my portfolio at $41.33. I sold it for $64.51 about two years later. Along with $9.93 in distributions, my total returns were just over 80%. Another one of these rare investments has also done well for current High-Yield Investing subscribers. I added it to my portfolio in late October 2010. I’ve received $4.28 per unit in distributions and the price has soared. So far, total returns are more than 50% in just 16 months. I like to return to investment ideas that have done well for me. So it comes as no surprise that I’m again looking into one of the highest-yielding, yet rarest, income investments on the market — royalty trusts. These trusts are designed for one thing: to pay out royalties, or a share of production revenues, from a field of existing oil and natural gas wells. The first trust debuted in 1979. Amazingly, even after more than 30 years there are still only about two dozen publicly traded oil and gas royalty trusts. And between 1999 and 2007, no new royalty trusts were created. But in the past year, there has been a small renaissance in royalty trusts. I count four new trusts that have come to market in the last two years alone. For income investors, the sudden surge of interest is good news. Routinely providing yields of about 10% or more, royalty trusts can seem too good to be true. Why, then, are oil and gas companies spinning off properties into publicly traded trusts? Trusts allow the parent company to get full value for their reserves while also raising money, without diluting their common shares or going further into debt. But there is one potential hang-up. By definition, these new trusts don’t have an established track record of generating cash flow from their reserves. Instead, you must rely on the company’s production projections and price assumptions, as stated in the prospectus. That’s the downside. But it’s offset by at least two benefits. First, recent trusts are being formed for a set life or “term” of 20 years. For example, SandRidge Permian Trust (NYSE: PER) was formed on May 12, 2011, and will dissolve by March 31, 2031. The parent company or sponsor endows the trust with proven reserves that have high-probability development opportunities to ensure the term is fulfilled. In contrast, many older trusts formed in the early 1980s have consumed much of their original reserves. Although new production technologies have allowed them, in some cases, to draw more production from their reserves than originally anticipated, they still have a much shorter remaining reserve life. The average reserve life for older royalty trusts is about 8.3 years, versus 20 years for some of the newer trusts. Once the reserves are used up, a trust expires and any remaining assets are distributed to unitholders. It can’t issue equity or debt to acquire new reserves. A second benefit is some new trusts have created “subordinated units.” (Royalty trust shares are called units.) These units, which are held by the trust’s sponsor, support the distribution rate to common unitholders. They work like this. When SandRidge Permian was created, sponsor SandRidge Energy (NYSE: SD) set aside 25% of the outstanding units for itself as subordinated units. These units are also entitled to receive distributions… with a catch. The trust forecasts target distributions for several years in advance, based on projections of production volumes, commodity prices, the effect of hedges, expenses and taxes. Then a subordination threshold is also established. For the SandRidge Permian Trust, the threshold is 20% below the target distribution. If the distribution ends up being less than the subordination threshold, the sponsor will make up the difference by reducing or foregoing the distribution on subordinated units. This way, there is some assurance that distributions will reach a pre-determined level should commodity prices fall. In return, if the distribution is substantially higher than the target, the subordinated shares will receive an extra share of distributions. These subordinated shares don’t last forever. The parent company retains these subordinated shares until new wells that the trust is also required to drill are completed. Then, a year later, the subordinated shares convert to common shares. Now before you dive into any trust, there is plenty more to know. Taxes are a little trickier than with a common stock, and trusts will perform differently based on their hedging programs and their production mix of oil and natural gas (I detail all of this in my March issue of High-Yield Investing). However, if you’re looking for a place to still capture high yields when interest rates are near zero, this sector may be small, but also holds plenty of promise. Disclosure: Neither Carla Pasternak nor StreetAuthority own shares of the stocks mentioned above. In accordance with company policies, StreetAuthority always provides readers with at least 48 hours advance notice before buying or selling any securities in any “real money” model portfolio. Members of our staff are restricted from buying or selling any securities for two weeks after being featured in our advisories or on our website, as monitored by our compliance officer. The idea of finding an undervalued stock is enticing, but how can investors distinguish between an international value tap and a bottomless money trap? Private investor and newsletter writer Chen Lin combs every continent to find junior exploration and production companies whose balance sheets outshine low stock valuations. In this exclusive interview with The Energy Report, Lin shares some lesser-known names that offer major profit potential. COMPANIES MENTIONED: COASTAL ENERGY CO. – GROUNDSTAR RESOURCES LTD. – HARVEST NATURAL RESOURCES – IONA ENERGY INC. – ITHACA ENERGY INC. – MART RESOURCES INC. – NEW ZEALAND ENERGY CORP. – PAN ORIENT ENERGY CORP. – PETROBAKKEN ENERGY LTD. – PORTO ENERGY CORP. – PROPHECY COAL CORP. –PROPHECY PLATINUM CORP. – TRANSGLOBE ENERGY CORP. The Energy Report: Chen, you follow world events very closely. Do events in Europe, especially Greece, have any effect on any of your decisions to buy or sell? Chen Lin: Yes, but I look more at the fundamentals. Greece is on the edge of bankruptcy, but I think the market is well prepared for that. I’m looking more at whether there’s a major impact to the financial markets. TER: How would it affect the way you trade? CL: If we have another round of a huge deleveraging, I think I will be more conservative in general. I’ve become very aggressive in my investing since the beginning of the year because the European Central Bank (ECB) did another round of money printing and low-interest loaning to all the banks for three years. That dramatically expanded balance sheets, just like quantitative easing (QE) did in the U.S.
TER: You have had stellar returns in your portfolios. You grew $5,411 as of Dec. 31, 2002, to $1,383,041 by Dec. 31, 2011, but your portfolios were down 11% in 2011. What were the issues that resulted in that downturn? CL: In 2008 I had a down year by a similar amount. I usually invest mostly long in the market, and I like to invest in undervalued stocks. Sometimes if they are extremely undervalued, I overweight them. So that tends to concentrate those stocks. When the market is down and investors don’t recognize the value, my stocks can be dragged down along with the overall market. Considering how tough the market was in 2011, I think I did relatively well in the period. I’m up quite significantly since the beginning of this year. People were seeking refuge in U.S. Treasury bonds, and now are suddenly starting to put money back to work. There has been a huge run-up of commodities and commodity-related stocks. TER: At the end of 2011, you said that energy stocks were on a year-end clearance sale. After some price appreciation, are they still on clearance? CL: A lot of the stocks I own have already appreciated dramatically since the beginning of the year, some even close to 100%. However, because they went down very hard last year and people panicked and sold everything they could to raise cash, I think there are still a lot of extremely undervalued energy stocks right now. Historically, if you compare the risk-reward, they’re still extremely undervalued. So I’m still overweighting energy versus precious metals. TER: Are you currently trading out of equities that have greatly appreciated since the beginning of 2012? CL: No, I am not. Well, some stocks I have, but mostly I’ve stayed with what I’m holding. I believe this rally still has legs. My largest position is Mart Resources Inc. (MMT:TSX.V), and my second largest is Pan Orient Energy Corp. (POE:TSX.V). Although I’ve been mentioning them in my newsletter for quite some time, I am still holding and riding those two stocks. I believe they are still very much undervalued. TER: You’ve written that you’re expecting some big news from Mart pretty soon. CL: I’m hoping the company can deliver a dividend. Its cash has been increasing dramatically in the past few months. It’s going after light sweet oil in Nigeria and selling it at a premium to Brent crude, so the company has a lot of free cash flow. The money is just piling up on its balance sheet, and I expect that to continue for the rest of the year. It’s pretty amazing that only two years ago the company was close to bankruptcy. Since then, it has just changed dramatically, and I don’t think it is appreciated by the market. I’m still very optimistic about the company and holding my position. TER: Mart Resources has given back about 6% over the past month. Is this a buying opportunity? CL: I think so. If you compare the valuation of Mart to other companies in the space, seldom do you see a company trading potentially at one or two times this year’s cash flow. Potentially, it could more than double its cash flow next year because it is finding more and more oil. Every well has been great in the past two years. That’s very unusual for a junior company. In addition, its wells have no decline. That’s something that amazes me because if you look at nearly all energy companies, you’re looking at very sharp declines in the first three to six months. TER: Is there no sign at all of depletion? This huge oil field just continues to keep producing? CL: That’s the thing. My guess is that it is sitting on a huge oil pool that’s interconnected and extends over a very big range. Once it pumps oil out, still more oil flows to the area, and so there’s no decline. This type of well is very hard to find on earth except in Saudi Arabia and a few other countries. TER: So, Mart is producing oil that gives the company a marketing advantage because light-sweet refinement is low cost and therefore commands a premium price to Brent crude. Plus, depletion is not notable yet. What am I missing? I’m sure the picture can’t be this bright. CL: Exactly. Well, the issue is Nigeria. It is a country where there are frequent protests and attacks on the pipelines. But those conflicts are mostly in the north, whereas Mart operates in the south, near the coast. So it’s pretty far away from the major violence. There is still tremendous opportunity and tremendous cash flow for this company. I think this will be the year when people see a dramatic rise in cash on its balance sheet and hopefully, with all that cash, it can pay dividends and bring in more rigs. It will build a pipeline and do everything organically without coming back to the market. That’s the beauty of this. TER: A year ago you said you expected investors to begin accumulating shares in Pan Orient based on anticipated production from its big land position in Indonesia. You were correct. Shares are up more than 60% over the past three months. How much more growth can we expect? CL: Pan Orient has a slightly different thesis than Mart Resources because there is some exploration/discovery risk. It is drilling wells, potentially very big wells, but I don’t know if the wells will be successful. With Mart, there is much more certainty. However, though there is risk for Pan Orient, it is a very experienced oil exploration company, and it’s been in Thailand for five years, drilling and fine tuning its technology. I shared with my subscribers a report that estimates each of the three Pan Orient wells in Indonesia is worth about $3 of net asset value (NAV)/share if successful in the first half of 2012 and $2 for each of the other three wells in the second half of 2012. In addition, Pan Orient also has an oil sands property in Canada that it wants to sell. The company has $1/share cash on the balance sheet and cash flow over $1/share right now, and this is in addition to the oil sands property that it has for sale. Thailand is ramping up production and Indonesia has the big wildcat wells at work. So in terms of risk-reward, it’s an ideal situation. I wouldn’t be surprised to see the stock be a ten-bagger by the end of this year. The company could be a $1 billion (B) company. It was a $2 stock when I recommended it in my newsletter. Right now it’s $3 and change. With some success in drilling in Indonesia, I’m looking for a ten-bagger. Seldom do you have those in one year, so I have pretty high hopes on the stock. TER: What other companies do you like? CL: This year, I have put a new fracking company in my newsletter, New Zealand Energy Corp. (NZ:TSX.V; NZERF:OTCQX). It has done very well so far. The stock has really exploded, and some of this excitement is about the company getting ready to explore for shale oil in New Zealand. The company has a big land package, and I think Apache is going to start drilling in April not far from their huge land package, and so we may see some results in H212. In the mean time, the company has drilled a nice conventional well, which has 500 barrels per day on restricted flow. It is drilling the second well and planning the third. The success of the current drilling program can move the stock as well. I still have Porto Energy Corp. (PEC:TSX.V) on my list. It was one of my biggest losers last year. You win some and lose some. The stock has been down to about $0.11 recently, but I’m seeing significant insider purchases. The company has about $10 million (M) in working capital, but it doesn’t intend to use all the money to drill the well on its own and then have to come back to the market to raise money at this depressed level. Instead, it is looking to do a joint venture (JV). So basically it would like its partner to pick up the costs and risk. I just spoke with the company, and management is still optimistic about getting a JV deal very soon. Porto is unique in that it has a huge land package in Portugal of over 1M acres on trend with the North Sea. TER: You’ve said that the Portuguese government wanted to do anything it could to help Porto, and so it’s disappointing to see that the stock has been so weak. What is the government doing to help the company? CL: I think the government is making it easier to get permits. Porto has drilled three dry holes. It hasn’t found any major oil yet, and that was its big downfall last year. I was told last year that if it found oil it would be easier to work with the government to bring the oil into production. Portugal is trying to do everything it can to avoid the fate of Greece, and so an oil discovery would be very significant. Porto is being run by very experienced oil guys, and most of them came from Devon Energy Corp.’s (DVN:NYSE) international division. In fact, Joe Ash was running the International division, but he left a comfortable, high-paying job to run Porto because he believes in the potential. You can see from insider trading reports that he has recently purchased more shares with his own money. So that tells you the people still believe in the whole thesis of finding massive amounts of oil in Portugal. TER: At this low $25M market cap, it seems like Ash with a few other people could easily buy this company and take it private. CL: Yes. But when the stock went down, the company adopted a poison pill. I think it’s afraid of a hostile takeover. Taking it private is possible. TER: You mentioned New Zealand Energy. Its shares, as you indicated, have gone to the races. The company is up well over 100% over the past three months. That’s a lot of conviction. CL: I believe there is the potential of doing fracking on this Bakken-like land. There will be some development later this year, and that’s actually driving the stock price. This stock is still very undervalued. TER: Are there other companies you like? CL: There are quite a few still that I like. PetroBakken Energy Ltd. (PBN:TSX) has been a big winner for me. It was paying a 10% dividend when I picked it up, but it’s up almost 70% since then, and now it is paying a 6-7% dividend. The key is that if you compare the company with other North American-based fracking companies in Bakken plays, it’s still relatively cheap. I think it could potentially have more upside, but the easy money has been made with this stock. I am also holding Prophecy Coal Corp. (PCY:TSX; PRPCF:OTCQX; 1P2:FSE) and Prophecy Platinum Corp. (NKL:TSX.V; PNIKD:OTCPK; P94P:FSE). Both stocks are rising this year. I like Prophecy Coal as it is getting close to a contract with Mongolia’s government. That will lead to financing and construction of the power plant. Prophecy Platinum should have its preliminary economic assessment very soon, so investors can get a peek of the project’s huge potential. TER: Most of your stocks are microcap companies. I find it interesting that you own Petrobakken, which has such a large market cap at $2.8B. CL: As far as market cap, it’s one of the largest I own now, but it had been hit very hard, and thankfully I was able to pick it up when it was quite depressed. TER: What about another company that you like? CL: Another company I like, which still hasn’t appreciated much, is Harvest Natural Resources (HNR:NYSE). This company has had bad luck like Porto. It drilled three dry holes in a row, and the stock is still very close to its 52-week low. The main attraction is that it has a big oil field in Venezuela. If you are looking at normal valuations, and if it’s not in Venezuela but rather a country friendlier to the U.S., then the company is probably worth at least $20/share. The stock is trading at $6–7. Venezuela is going to have an election this year in the fall, and Hugo Chavez will be seeking his third term. With all the things happening around the world, like the Arab Spring, I wouldn’t be surprised if Venezuela has some major changes this year. If that’s the case, this stock can have a huge upside. TER: Harvest Natural just hit another dry hole, but clearly the dry holes don’t make you as nervous as the Venezuelan government, is that right? CL: If it gets a hit in Indonesia that would be great. But this company already has a huge oil field in Venezuela that is self-funding. It doesn’t need to put money in. It was hoping to get money out as dividends for shareholders, but so far it has been having trouble getting any money out because of the government. But this could change overnight if the government has a change of regime. TER: What other companies did you want to mention to us today? CL: Another company is TransGlobe Energy Corp. (TGL:TSX; TGA:NASDAQ), which I own. It is operating mostly in Egypt and Yemen. If you compare the company, cash-flow wise it is very, very cheap. Due to political problems, the company has mostly stopped production in Yemen. If it can start flowing again in the country, that would be another big catalyst. I like the stock, and I own the stock and options. TER: What effect has the Arab Spring in Yemen had on TransGlobe’s business? Its shares have been above water for the last six months. CL: The Arab Spring in Yemen actually depressed the stock. It used to produce from Yemen but because of violence, it stopped producing there. Any peaceful resolutions and new production would be a big plus. TER: Any other positions you could talk about briefly? CL: I also have two companies in the North Sea. Both did very well. One is Ithaca Energy Inc. (IAE:TSX). It just went up 40–50% because of a potential takeover. Another is a Iona Energy Inc. (INA:TSX.V), which was funded by the founder of Ithaca Energy. Both of these have done very well. TER: Do you have any new positions? CL: I recently purchased Coastal Energy Co. (CEN:TSX.V), operating in offshore Thailand. It has been growing its production quite dramatically in the past year, and it continues to grow. TER: Coastal is another larger name with a $2B market cap. But just the opposite is Groundstar Resources Ltd. (GSA:TSX.V), which you owned last year. CL: Yes. Groundstar was one of the worst stock picks I had last year. It drilled a well in Iraq and one in Egypt, and every well it drilled turned out to be a dry hole. So I had to cut my losses and get out of the stock when I saw it was raising money and diluting shareholders at a very low share price. The stock would have probably had a difficult time rebounding. TER: It is so nice speaking with you again, Chen. Thank you for your time. CL: I enjoyed it. Thank you. 1) George S. Mack of The Energy Report conducted this interview. He, personally and/or his family, own shares of the following companies mentioned in this interview: None. 2) The following companies mentioned in the interview are sponsors of The Energy Report: Mart Resources Inc., New Zealand Energy Corp., Prophecy Coal Corp., Prophesy Platinum Corp., Iona Energy Inc. and TransGlobe Energy Corp. Streetwise Reports does not accept stock in exchange for services. 3) Chen Lin: I personally and/or my family own shares of the following companies mentioned in this interview: Mart Resources Inc., Pan Orient Energy Corp., New Zealand Energy Corp., Porto Energy Corp., Devon Energy Corp., Petrobakken Energy Ltd., Prophecy Coal, Prophecy Platinum, Harvest Natural Resources Inc., TransGlobe Energy Corp., Ithaca Energy Inc., Coastal Energy Co. and Groundstar Resources Ltd. I personally and/or my family am paid by the following companies mentioned in this interview: In early 2010, when Porto Energy was a private company, Chen Lin received shares from the company to introduce it to hedge funds. I was not paid by Streetwise for this interview. First, the sovereign-debt crisis. The money that’s going to come out of bonds has to go somewhere. It can’t all go into gold, silver and commodities. So as money shifts out of sovereign-bond markets in Europe, and eventually the United States, there’s going to be a huge influx of capital into stocks — especially the cream-of-the-crop stocks, the blue chips and top S&P 500 names. Second, precisely because of the European debt crisis, the U.S. looks like a heck of a lot better place to invest these days, especially for Europeans. That’s a corollary of the above point, but it’s already in force — European money is showing up on U.S. shores in droves, and most of it is going into U.S. stocks and bonds. Third, as I’ve often said in the past, good quality stocks can often take on many of the attributes of commodities. In the sense that stocks can and often do inflate higher with money-printing and inflation, they can and do adjust upward as the underlying currency depreciates, or in anticipation of a currency devaluation. This happened in the 1930s … and in just about every third-world and emerging-market country that experienced a depreciating currency. From Argentina to Brazil, from Indonesia to Malaysia, from Pakistan to Zimbabwe. The only difference now and in the future is that the sovereign-debt crisis is not happening in emerging or third-world countries but instead is hitting the FIRST WORLD! So, what could cause a new bull market in stocks when there are so many problems in the world? The worldwide money-printing phenomenon will not be the cause of it. Even though money-printing is bullish for commodities and stocks, it’s not necessarily bullish all the time. For instance, a lot of the recent money-printing has managed to help (at least temporarily) push back the European sovereign-debt crisis. So this can have the effect of temporarily taking some of the shine off of tangible assets. We’ve seen this happen in sugar, coffee, cotton and select other commodities that normally do well under a money-printing scenario, but are not doing so now. And notably, right now the money-printing has largely gone to support banks in Europe. To help liquidity, to help the banks remain solvent, to help the credit markets, to bail out Greece again, and more. But the money is not yet finding its way into the private sector, where loan demand and credit remains tight. So the fires of inflation are NOT being stoked by the current money-printing, and the inflation force behind a bull market in commodities or stocks is not yet here, either. Simply put, money-printing is inflationary and bullish for asset prices under most scenarios, yes, but not always. If it were, gold would already be at new record highs because there’s a heck of a lot more money-printing going on now than before. But When Is That Day Coming? As strong as gold and silver appear … as strong as the Dow Industrials … the S&P 500 … and even oil look — they are not yet at the point where I can confidently say that new bull legs higher are starting. Yes, I have been wrong in the short term. Very wrong. And I dislike that just as much as you do. In fact, I personally am and have been short gold, silver, oil and the S&P 500 in the futures markets. So I fully understand how lousy it feels when you’re on the wrong side of the market. But I will not succumb to emotions, guilt or popular sentiment just because I’ve been wrong in the short term. That would be the worst thing to do. Instead, I have to go with hard, technical evidence gathered from my more than 30 years of experience, and from all my trading models and indicators, to draw my conclusions. Gold has taken out the December high, which is very positive for the longer term. It confirms that gold is still in a long-term bull market. But that’s all it says. To truly break out to the upside, we need to see gold take out the $1,808 and $1,835 levels — preferably on a weekly or monthly closing basis. Until then, gold remains in a very broad trading range that could easily see gold plunge back down. Silver, as noted previously, needs to take out the $35.85 level on a monthly closing basis. 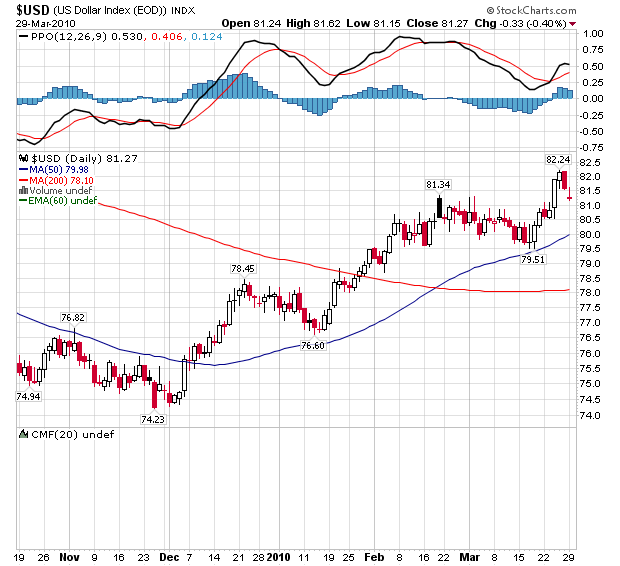 If silver cannot close above that level on Tuesday, February 28, then it is still at risk of a sharp decline. For the Dow Industrials, we need to see a close above the 12,850 level at month-end, before I can say for sure that the new bull market in the Dow that I’ve talked about many times is here. Short of that monthly breakout and buy signal, the Dow also remains at risk of a sharp decline. In oil, we need to see a close above the $111 level before I can confidently say that a renewed long-term bull market in energy is back. This may occur this week, or next month. But no matter what, you can rest assured that, when these markets are fully flashing green, any money you missed out on making recently or any hits you may have taken following my short-term calls will be more than made up for. Many times over. P.S. Our natural-resources expert Sean Brodrick is finalizing an urgent series of recommendations on some new natural gas companies that he’s looking at … and his instructions went out at 1 PM Eastern Time Monday, February 27. To get the full story on this incredible “New Fuel Revolution” straight from Sean … and to learn how to get the names of these stocks as soon as he reveals them, click here immediately! Larry has nearly 33 years of investing experience with a focus in the precious metals and natural resources markets. His Real Wealth Report (a monthly publication) and Resource Windfall Trader (weekly) provide a continuing education on natural resource investments, with recommendations aiming for both profit and risk management. For more information on Real Wealth Report, click here. For more information on Resource Windfall Trader, click here. Warren Buffett has said that if you look around the poker table and you can’t spot the patsy, you’re it. In that spirit, another famed investor, Jeremy Grantham, is trying to deal investors a better hand. 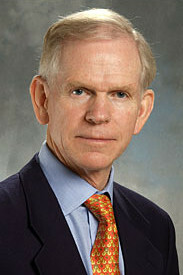 Jeremy Grantham is a British investor and Co-founder and Chief Investment Strategist of Grantham Mayo Van Otterloo (GMO), a Boston-based asset management firm. GMO is one of the largest managers of such funds in the world, having more than US $107 billion in assets under management as of December 2010. Grantham is regarded as a highly knowledgeable investor in various stock, bond, and commodity markets, and is particularly noted for his prediction of various bubbles. Grantham doesn’t mince words. In Grantham’s view, outlined in a quarterly letter published late Friday, individuals launched into the market have embarked on “dangerous investment voyages” that threaten to separate them from their money. They hear the tempting call of countless stock-market sirens — self-interested cheerleaders and barkers who promise that it’s different this time, and that you must buy now or miss the boat. Making the journey even more perilous is that stocks around the world are either fairly priced or nearly so, he says. Investors who buy now can expect meager returns over the next seven years. “Every segment of the gold stock market is very cheap today.” Opportunities abound across the spectrum of precious metal equities, which remain undervalued as bullion prices continue their upward trends. That’s the word according to Charles Oliver and Jamie Horvat, both senior portfolio managers at Sprott Asset Management. In this exclusive interview with The Gold Report, Oliver and Horvat express cautious optimism about the prospects for gold stocks in 2012. COMPANIES MENTIONED: BARRICK GOLD CORP. – BELO SUN MINING CORP. – CANACO RESOURCES – COEUR D’ALENE MINES CORP. – COLOSSUS MINERALS INC. – CONTINENTAL GOLD LTD. – GOLDCORP INC.– HECLA MINING CO. – LAKE SHORE GOLD CORP. – PAN AMERICAN SILVER CORP. – PERSEUS MINING LTD. –PREMIER GOLD MINES LTD. – SCORPIO GOLD CORP. – TAHOE RESOURCES INC. The Gold Report: When we talked in the wake of the debt ceiling crisis last fall, Charles, you expected volatility to be good for gold and forecast a continuing long-term bull market for precious metals. These days, the scary stories pertain to the European Union (EU). Will negative headlines continue to play a role in the price of gold and silver? Charles Oliver: Absolutely. The headlines about the European Central Bank (ECB) infusion of billions of euros into the banking system has been very good for the price of gold. Since the ECB announced it would be issuing €489 billion in December, gold has had a nice little rally off its lows. I expect in the next couple of weeks a further issuance of money will be quite supportive for gold. Europe is still a mess. Greece seems to be heading to bankruptcy in slow motion. That problem has been going on for two years and we could find these issues still persisting a year from now. Ultimately, central banks around the world will continue to print and debase their currencies, which will be very good for the gold price. TGR: Jamie, do you agree with that? Or might Greece strike a deal to pay off its debt, turning the price of gold down? Jamie Horvat: I think the deal is based on the fact that the only tool governments have at their disposal is the continued monetization of debt and the continual printing of money, which is always good for gold. On the other hand, if Greece does not get the sought-after debt relief and restructuring or, if it is kicked out of the EU, it could result in the unwinding of the European banking system and could have larger implications globally. If that happens, we’ll see a short-term hiccup in the gold price as it is used as a source of liquidity and investors sell their future in an attempt to live and fight today. That may be the tail-risk event as we continue to see additional quantitative easing (QE) programs all over the world. From Japan to the UK, more than $1 trillion could be spent in the next few months to provide ongoing liquidity in Europe. That is why the longer term outlook for gold is still positive. TGR: In a November television interview, Charles, you expressed concern about China’s growth. Has that changed? And what are the implications for precious metals? CO: The China story affects the industrial metals more than the precious metals, but I’m still concerned that we see weakness in China. The volume of loans being done now and the contraction we’re seeing there both signal that weakness. A number of other economic statistics indicate that China is clearly slowing down; the only question is how big a slowdown it is. Ultimately I think it will impact the base and bulk metals more than gold and silver—copper, iron ore, steel, those types of things. TGR: Your $644.5 million Sprott Gold and Precious Minerals Fund ended 2011 with a tough quarter, off 10.6% compared to an 8.7% loss on the benchmark S&P. Your quarterly report cited tax-loss selling as one of the reasons for thinly trading stocks performing poorly. Have you adjusted your portfolio since then? CO: The portfolio is continuously being upgraded. We made a number of changes during the last quarter. We did some of our own tax-loss selling in the portfolio. When I sold some of those stocks, I tried to redeploy the proceeds into some of the other names that I wanted to own that were also experiencing tax-loss selling. A lot of companies in the junior space were down 70%. It wasn’t through any fault of their own; it was just because the market had no interest in small companies because it was risk averse last year. TGR: Were the other names you were buying into mainly juniors? CO: Yes, there were a fair number of juniors, but every segment of the gold stock market is very cheap today. I can find great valuations in small-, mid- and large-cap stocks. All of them are extremely cheap. That’s not always the case. You might think all segments would move together, but in reality one segment often does much better than the others during a particular year. TGR: It appears as if about 30% of the fund is dedicated to the small-cap issuers, which have a little bit higher risk profile then the large caps. Do you see those small caps as the way to drive growth in the portfolio? CO: If you look over the last decade, a lot of the alpha that’s being generated in the gold fund has been through small- and mid-cap names. That’s across the board. Whether in the gold space, the oil space or any other type of stock, generally speaking, small-cap stocks have better growth and long-term growth returns. TGR: What are some of the juniors you picked up as you were redeploying at the end of the year? CO: I can mention a few names from my most recent year-end report for investors. Canaco Resources Inc. (CAN:TSX.V) is a small cap with a project in Tanzania. It did a financing at around $5.40/share back in March 2011. It’s a good stock, but through tax-loss selling and an aversion to small-cap stocks, it has traded down to below $1.50/share. What a great opportunity. I looked at Canaco several years ago. It was really interesting, but it was a little on the early-stage side and it got away from me. I’m not one who likes to chase stocks; I don’t run after them. And then last year, Canaco had a lot of cash on its balance sheet and suddenly came under severe selling pressure. I thought, “Great, I’m getting a second opportunity to buy something at a much better price.” Additionally, I expect its property in Tanzania will one day be a mine. TGR: How many years away is that? CO: Probably 5 to 10 years. The lifecycle in the mining industry is usually at least that long from a grassroots discovery through permitting, construction and ultimately getting into production. In the small-cap space, I’m always on the lookout for companies that I believe will have a mine at some point in the future. Canaco is a good example of that. TGR: Any other examples of companies that could be big movers in 2012? CO: Another company, Lake Shore Gold Corp. (LSG:TSX; LSG: NYSE) was down 70% in the last year. I actually owned it a couple of years ago, and thought it got expensive. It was trading north of $4.50/share not too long ago, and went down to almost $1/share. The company had a few hiccups in terms of its mine plan, but the stock has been overdone. I sold it up much higher and took this as an opportunity to get involved with it again. TGR: How high could it go? CO: There is no reason Lake Shore Gold can’t get back to the highs it made last year if it executes on its strategy. These things usually just take a bit of time. TGR: Eric Sprott is probably one of the leading silver bulls in the world. In your view, what’s the ideal balance between gold and silver equities and bullion in an investors’ portfolio? CO: I believe it makes a lot of sense to have a combination of both stocks and bullion. It really depends on the individuals in consultation with their financial advisors to get the appropriate allocation. Bullion is an asset that helps preserve capital. You’re not there to make a killing. You’re there to protect capital, especially in the context of the currency debasement that is going on. Gold stocks are more of an asset used to capture capital gains during the bull market we are in. Many studies have suggested that 5–10% on a long-term basis is a good allocation to precious metals. I’ve heard some numbers much higher at the Sprott organization, but again, I think it ultimately depends on an individual’s goals, propensity for risk and capital preservation requirements due to age and circumstances. TGR: What are some of your favorite names among silver equities? CO: I like the large caps. Pan American Silver Corp. (PAA:TSX; PAAS:NASDAQ), which is trading at about 9–10 times its price/earnings (PE) ratio, has potential to double production over the next five years as it builds its Navidad mine in Argentina. Pan American is fully funded to get that growth. Coeur d’Alene Mines Corp. (CDM:TSX; CDE:NYSE) is another one trading at about 9–10 times its PE ratio. It has doubled production over the last four to five years. This company actually has done a great job; it’s one of the few over the last couple of years that have managed to do a pretty darn good job of keeping cash costs very low. If you look at almost all of the large-cap silver names, you’ll find most of them trading either at high single-digits to low double-digit PE ratios. They are extremely cheap. TGR: What are some catalysts that could take Coeur d’Alene to the next level? CO: I think it’s just a matter of time and execution. Ultimately these companies will make good earnings and cash flows at the current price. One of the things we’ve seen in the gold sector, and are certain to see a bit in the silver sector, is that a lot of these companies are starting to initiate dividends. Last yearHecla Mining Co. (HL:NYSE) announced a plan to pay a dividend linked to the silver price. In a recent presentation I attended, Coeur d’Alene suggested that it might start looking at paying a dividend sometime next year. TGR: Could that have a big impact on the share price? CO: We will have to wait and see, but I think investors look for good companies that pay nice yields. TGR: What are some other promising silver names? JH: On the development and exploration side, Tahoe Resources Inc. (THO:TSX) has great potential as it moves toward production on its flagship Escobal project in Guatemala. We like what we see in Tahoe’s exploration there—the whole development story. It may have a world-class asset with the resource and reserves it currently has on hand—plus significant exploration upside as well. Scorpio Gold Corp. (SGN:TSX.V) is a junior that has come off the bottom. Scorpio has been viewed in the past primarily as a base metals company and a zinc producer, but most of its upside in terms of both exploration and production now comes from silver exposure. I continue to like Scorpio. TGR: With so many companies in the small- and large-cap area beaten down, how do you determine which ones will deliver? JH: As Charles mentioned, valuations are pretty depressed. Looking at the large caps broadly, you have to distinguish between those that are executing projects and those that aren’t. Among the companies reporting recently, Agnico-Eagle Mines Ltd. (AEM:TSX/NYSE) and Kinross Gold Corp. (K:TSX; KGC:NYSE) are two examples of companies that unfortunately lost some ground. Agnico enjoyed a premium thanks to its growth profile, but lost that premium because it didn’t execute on that growth profile. Kinross, too, has declined due to the lack of execution. On the other hand, Barrick Gold Corp. (ABX:TSX; ABX:NYSE) was in line and Goldcorp Inc. (G:TSX; GG:NYSE) was above estimates. Both Barrick and Goldcorp have growth projected into 2016, but they’re trading at depressed multiples to the group. Goldcorp has 60% growth ahead of it. Investors who have been going to the price participation of exchange-traded funds or gold bullion will slowly start coming back to the market if some of these companies continue to capture that cash-flow margin and continue to increase dividend payments. They will be attractive to investors if they show a willingness to return capital to shareholders. In terms of the market in general, investors seem to want to be paid to participate in the market, so they are looking for companies with yield. TGR: What names fit the criteria you mentioned for companies that have upside ahead of them? JH: Based on projects in development and assuming they continue to execute and move the projects forward, some of the names I like are Belo Sun Mining Corp. (BSX:TSX.V), Colossus Minerals Inc. (CSI:TSX), Continental Gold Ltd. (CNL:TSX), Premier Gold Mines Ltd. (PG:TSX) and Perseus Mining Ltd. (PRU:TSX; PRU:ASX). These are all things I continue to monitor and continue to like. TGR: Belo Sun is sitting at about $1/share now. What do you like about it? JH: Belo Sun’s 100% owned Volta Grande project in Brazil is located in an area with good infrastructure and the government is building the world’s third-largest hydro-damming facility just to the north. It’s a really good project with recent—and continuing—exploration success, in a good jurisdiction with good economics around the project. I believe that has the potential to be a mine one day. Belo Sun also has added significantly to the resource and continues to move the project forward. I’ll continue to like those types of projects as long as they continue to execute. So far, though Belo Sun hasn’t been rewarded for its success. Small caps were down 38% on average in 2011. TGR: Do you have favorite jurisdictions? CO: When you look at the jurisdictions in our portfolio, about 80% of the companies are domiciled in Canada while 80% of the operations are international. We do have some big concerns about politics and country risk. A couple of years ago, when a lot was going on in Africa, we decided to cut back on some of our African names. Not eliminate them, but reduce the weighting and redeploy those funds into operations in North and South America. Now we are unfortunately experiencing some issues in South America, such as what is going on with the governments and some of the mining projects in Peru today. As with Africa earlier, last year we made an active decision to reduce exposure in Peru because of those concerns. You can’t pick where the mines are—that’s geologically where the gold deposits are and it takes you to some challenging places. That is why we like to be in a lot of different countries, to diversify that risk. I have concerns about Peru but I’ve got a little bit of Peru. I don’t like Russia particularly, but I’ve got a little bit of Russia. Having a basket of these cases can minimize the risk. Having said that, I should be able to buy these companies in higher risk regions at cheaper valuations. Otherwise I certainly wouldn’t invest there. TGR: Do you agree with that Jamie? JH: Definitely. Taking a basket approach and diversifying the risk within the portfolio has been our practice for a long time. There have been a lot of discussions around people seeking more politically secure jurisdictions. But even in Canada, even in British Columbia, we have seen mines not get permitted based on native land rights issues, water usage issues and other local issues. So risk isn’t confined to places such as Africa or Peru. Using that basket approach definitely helps mitigate the jurisdictional risk. TGR: You mentioned investors might start moving from bullion back into the stocks after a year when equities weren’t performing in line with the metals prices. The cliché is that investors are always wavering between greed and fear. What will give investors confidence to take a chance on some of these undervalued juniors? JH: I think it all comes down to execution. Are you executing on that project? Are you moving it forward? Are you building per-share value by growing the resources and converting them into reserves? Are you advancing the project and doing the feasibility studies? Are you wrapping the economics around the feasibility of the project and the value and the leverage that you can obtain from putting that into production in the market? Companies that continue to execute and build their resources and reserves will get rewarded. Unfortunately, a lot of companies have made some missteps in the market. TGR: Any other thoughts you would like to leave our readers with before we say goodbye? CO: Gold equities didn’t do very well in 2011. It was a tough year. The last time we had equities perform so poorly was 2008. Then 2009 and 2010 were exceptionally good years for gold stocks. 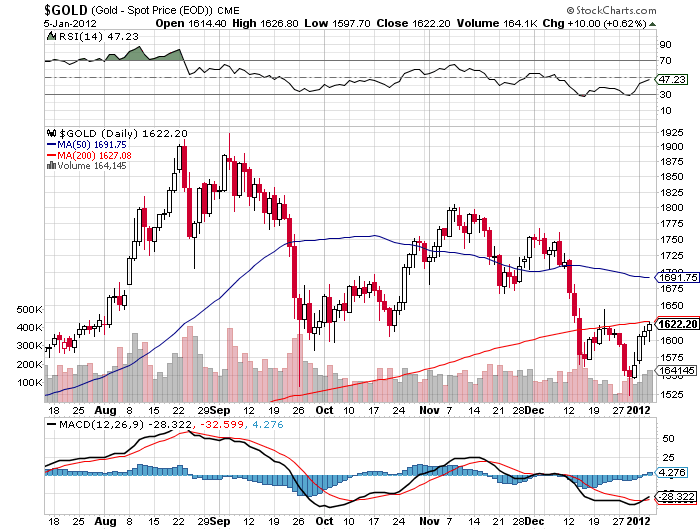 That pattern makes me cautiously optimistic that 2012 will be a very good year for gold stocks. JH: I totally agree—2011 was a “lite” version of 2008. Small caps were down 78.5–79% in 2008, and last year they were down 38% on average. The U.S. banks and the mortgage-backed securities issue were at the heart of the 2008 liquidity crisis, and in 2011 the issues have rolled into a European bank and sovereign debt crisis—with the U.S. opening up the swap lines again, with unlimited U.S. dollar amounts to help with liquidity to European banks through to February 2013, I believe. Taking all of that into account, I’m cautiously optimistic. I’m hoping that as in the second half of 2009 into 2010, when we had a significant recovery in the precious metal space, we will see a similar type of recovery in 2012. Bringing more than 21 years of experience in the investment industry, Charles Oliver joined Sprott Asset Management (SAM) in January 2008 as an investment strategist with focus on the Sprott Gold and Precious Minerals Fund (TSX:SPR300). Prior to joining SAM, he was at AGF Management Ltd., where he led the team that was awarded the Canadian Investment Awards Best Precious Metals Fund in 2004, 2006, 2007, and was a finalist for the best Canadian Small Cap Fund in 2007. At the 2007 Canadian Lipper Fund awards, the AGF Precious Metals Fund was awarded the best five-year return in the Precious Metals category, and the AGF Canadian Resources Fund was awarded the best 10-year return in the Natural Resources category. Oliver obtained his Honors Bachelor of Science degree in geology from the University of Western Ontario in 1987 and his Chartered Financial Analyst (CFA) designation in 1998. Jamie Horvat joined SAM in January 2008. He is co-manager of the Sprott All Cap Fund, the Sprott Gold and Precious Minerals Fund, the Sprott Opportunities Hedge Fund LP and the Sprott Opportunities RSP Fund. He has more than 10 years of investment experience. Prior to joining SAM, Horvat was co-manager of the Canadian Small Cap, Global Resources, Canadian Resources and Precious Metals funds at AGF Management Ltd. He was also the associate portfolio manager of the AGF Canadian Growth Equity Fund, as well as an instrumental contributor to a number of structured products and institutional mandates while at AGF. He joined AGF in 2004 as a Canadian equity analyst with a special focus on Canadian and global resources, as well as Canadian small-cap companies. Horvat spent five years at another large Canadian mutual fund company as an investment analyst before joining AGF. He holds a diploma in mechanical engineering technology from Mohawk College and earned an Honors Bachelor’s of Commerce degree from McMaster University. He is a member of the International Research Association and a licensed international financial analyst. He is also a member of the Ontario Association of Certified Engineering Technicians & Technologists.